Cobalamin, also known as B12, is a member of the water-soluble family of B vitamins. It is a key factor in the body’s proper use of iron and formation of red blood cells. The nervous system also relies on an adequate supply of cobalamin to function appropriately, as it is an essential component in the creation and maintenance of the myelin sheath that lines nerve cells. Other roles of cobalamin include working with pyridoxine (vitamin B6 and folic acid to reduce harmful homocysteine levels, participating in the metabolization of food, and keeping the immune system operating smoothly. Very small amounts of cobalamin are needed to maintain good health. The RDA value is 0.3 micrograms (mcg) for infants under 6 months, 0.5 mcg for those 6 months to 1 year old, 0.7 mcg for children 1-3 years old, 1.0 mcg for children 4-6 years old, 1.4 mcg for children 7-10 years old, and 2 mcg for those 11 years of age and older. Requirements are slightly higher for pregnant (2.2 mcg) and lactating (2.6 mcg) women. The primary conditions that benefit from supplementation with cobalamin are megaloblastic and pernicious anemia. Megaloblastic anemia is a state resulting from an inadequate intake of cobalamin, to which vegans are particularly susceptible because of the lack of animal food sources. Vegans, who do not consume any animal products including meat, dairy, or eggs, should take at least 2 mcg of cobalamin per day in order to prevent this condition. In the case of pernicious anemia, intake may be appropriate but absorption is poor due to a lack of normal stomach substance, called intrinsic factor, that facilitates absorption of vitamin B12. Large doses are required to treat pernicious anemia, which occurs most commonly in the elderly population as a result of decreased production of intrinsic factor by the stomach. Supplements are generally effective when taken orally in very large amounts (300-1000 mcg/day) even if no intrinsic factor is produced. These supplements require a prescription, and should be administered with the guidance of a health care provider. Injections, instead of the supplements, are often used. Male infertility can sometimes be resolved through use of cobalamin supplements. Other conditions that may be improved by cobalamin supplementation include: asthma, atherosclerosis (hardening of the arteries caused by plaque formation in the arteries), bursitis (inflammation of a bodily pouch, especially the shoulder or elbow), Crohn’s disease (chronic recurrent inflammation of the intestines), depression, diabetes, high cholesterol, osteoporosis, and vitiligo (milky-white patches on the skin). There is not enough evidence to judge whether supplementation for these diseases is effective. Usable cobalamin is only found naturally in animal source foods. Fresh food is best, as freezing and exposure to light may destroy some of the vitamin content. Clams and beef liver have very high cobalamin levels. Other good sources include chicken liver, beef, lamb, tuna, flounder, liverwurst, eggs, and dairy products. Some plant foods may contain cobalamin, but it is not in a form that is usable by the body. Cobalamin supplements are available in both oral and injectable formulations. A nasal gel is also made. Generally a balanced B-complex vitamin is preferable to taking high doses of cobalamin unless there is a specific indication for it, such as megaloblastic anemia. Strict vegetarians will need to incorporate a supplemental source of B12 in the diet. Cyanocobalamin is the form most commonly available in supplements. Two other, possibly more effective, types are hydrocobalamin and methyl-cobalamin. As with all supplements, cobalamin should be stored in a cool, dry, dark place and out of the reach of children. Cobalamin deficiency may be manifested as a variety of symptoms since cobalamin is so widely used in the body. Severe fatigue may occur initially. Effects on the nervous system can be wide-ranging, and include weakness, numbness and tingling of the limbs, memory loss, confusion, delusion, poor balance and reflexes, hearing difficulties, and even dementia. Severe deficiency may appear similar to multiple sclerosis. Nausea and diarrhea are possible gastrointestinal signs. The anemia that results from prolonged deficiency may also be seen as a pallor, especially in mucous membranes such as the gums and the lining of the inner surface of the eye. Megaloblastic anemia is a common result of inadequate cobalamin. This condition can also result if a person stops secreting enough intrinsic factor in the stomach, a substance essential for the absorption of cobalamin. In adequate intrinsic factor leads to pernicious anemia, so called because it persists despite iron supplementation. Long-term deficiencies of cobalamin also allow homocysteine levels to build up. Negative effects of large amounts of circulating homocysteine include heart disease, and possibly brain toxicity. Taking high levels of folic acid supplements can mask cobalamin deficiency and prevent the development of megaloblastic anemia, but neurological damage can still occur. This damage may become permanent if the cobalamin deficiency persists for a long period of time. The primary groups at risk for cobalamin deficiency are vegans who are not taking supplements, and the elderly. Older adults are more likely to have both insufficient intrinsic factor secreted by the stomach and low levels of stomach acid, causing cobalamin to be poorly absorbed. Malabsorptive diseases and stomach surgery can also predispose to a deficiency. People who are sensitive to cobalamin or cobalt should not take cobalamin supplements. Symptoms of hypersensitivity may include swelling, itching, and shock. 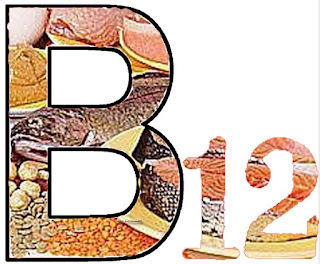 Adverse effects resulting from B12 supplementation are rare. Cobalamin should also be avoided by those who have a type of hereditary optic nerve atrophy known as Leber’s disease. Very high doses of cobalamin may sometimes cause acne. Large amounts of vitamin C taken within an hour of vitamin B supplements will destroy the cobalamin component. Absorption of cobalamin is also impaired by deficiencies of folic acid, iron, or vitamin E. Improved absorption occurs when it is taken with other B vitamins or calcium. Some medications may also cause an increased use or decreased absorption of this vitamin. Those on colchicine, corticosteroids, methotrexate, metformin, phenformin, oral contraceptives, cholestyramine, colestipol, clofibrate, epoetin, neomycin, or supplemental potassium may need extra cobalamin. Use of nicotine products or excessive alcohol can deplete B12.